The Digiflow flow meter is an excellent device, certified according to the new Italian water treatment legislation (DM25 2012). It is fully programmable with simple and easy understandable instructions (see below). The Digiflow 8000T uses AAA batteries and it is equipped with a sound alarm that warns you when battery power is too low. It allows you to control the system filters changing, where the supplies have different durations. Battery Installation: Slide off the cover case and put in 2 AAA batteries. Then, slide the cover case back on. Connection Fitting: Use the DigiFlow 8000T Flowmeter with 3/8" MNPT male connectors. Screw one 3/8" MNPT male connector into each end of the flowmeter. Setting Capacity & Timing: Keep pressing the Display Button and press the Reset Button at the same time. Release both buttons. The DigiFlow 8000T numbers will flash indicating the device is in setting mode. Press "Display" to choose the capacity in 100 gallon increments. Press "Reset" to save the capacity. Press "Display" to choose the timing in 30 day increments. Press "Reset" to save the timing. 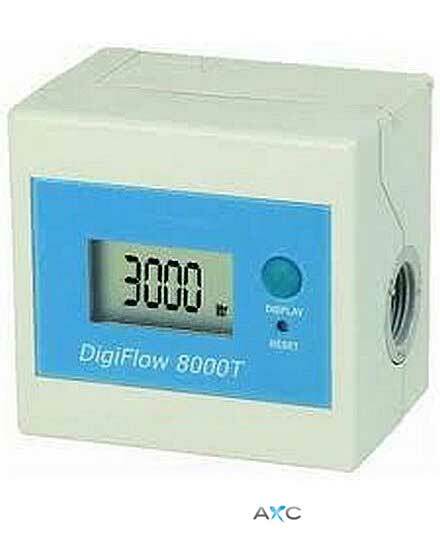 The DigiFlow 8000T flow meter will be automatically on when there is any water flowing through the sensor. It will be automatically off when there is no water flowing for 10 seconds. Display Button: Press "Display" to display the status of the 3 modes of the DigiFlow 8000T. Capacity Mode: Shows the capacity left. Timing Mode: Shows the timing left. Flow Rate Mode: Shows the current flow rate. The sequence in which they display are Flow Rate, Timing, Capacity. Reset Button: Press "Reset" to reset the setting to be the last setting. When Capacity is lower then 30 gallons or Timing is lower than 7 days, the buzzer will beep once and the digit will flash to alert you to prepare to change the filter cartridge. When Capacity reaches 0 gallons or Timing reaches 0 days, the buzzer will beep twice and the digit will flash to alert you to change the filter cartridge. When the battery power is lower than normal working level, the buzzer will beep twice to alert you to change the battery. The data will be kept in memory when the battery power runs out or the battery is removed. 01. Conical reducer Male Female 1/2 "- 3/8"
02. Conical reducer Male Female 3/8" - 1/4"